Femtosecond Laser Cleaning of Painted Artefacts; Is this the Way Forward? 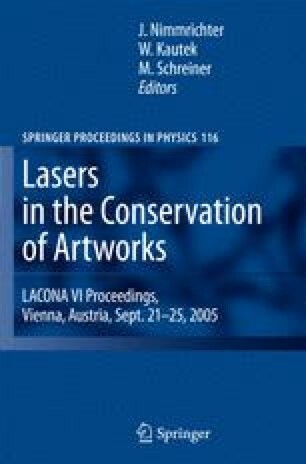 The laser cleaning of painted artefacts relies on the synergy of thermal, photochemical and photomechanical effects, which are involved in laser ablation. A crucial issue, however, for a successful cleaning intervention is the spatial confinement and control of these effects for safeguarding the original surface from potential damage. Extensive studies have shown that in many cases there is an optimum interplay of laser and material parameters, which resulted in successful laser cleaning applications. The laser pulse duration is an important parameter in this context.